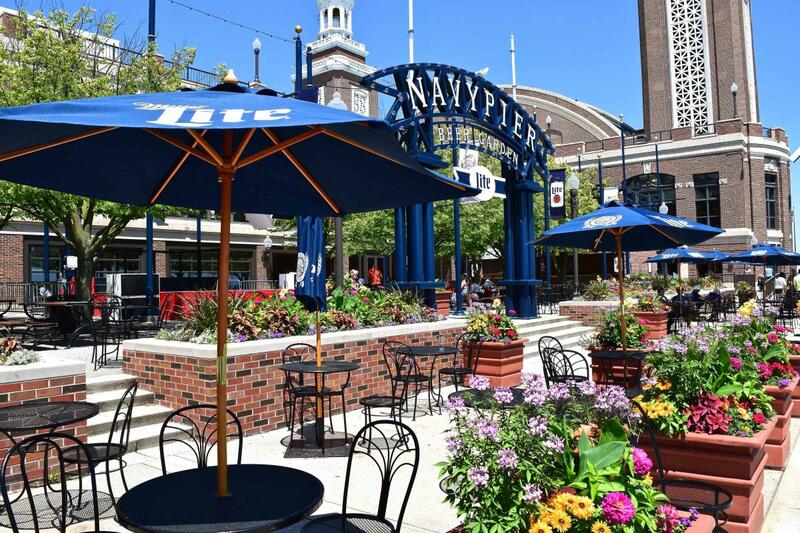 Located at the East End of Navy Pier, the Miller Lite Beer Garden is an Air & Water Show viewing hotspot on Saturday, August 19, and Sunday, August 20. You&apos;ll have a clear view of the festivities, both on the water and in the air, at this lakeside locale. To celebrate, the beer garden will have live entertainment all weekend long (lineup below). For guests craving a quick bite, the quick-service walk-up window offers summer favorites such as homemade pizza, brats and burgers as well as beer, wine, cocktails and frozen drinks. The Sand Bar Beer Garden, located at the center of the action on North Avenue Beach, near the northeast corner of the North Avenue Beach Boathouse (a.k.a. Castaways) will magically pop up during the Air & Water Show, August 19 and 20, from 10:30 a.m. to 3:30 p.m. (last call at 3 p.m.). This unique space allows guests to view the show from a private beach location, while enjoying food and drinks available for purchase. Menu items will include $6 cheeseburgers, $5 hot dogs, $4 bottled water, $1 bags of chips and $7 beers. FYI, this is the only space on the entire beachfront where alcohol is permitted during the Chicago Air and Water Show. Get into the Air & Water Show action by stepping aboard the Odyssey for a brunch or dinner cruise that promises premium views. The lake breezes will keep you cool as you enjoy not only the stunning show happening literally overhead, but also delicious meals and entertainment. Cruises take off from Navy Pier. Reserve in advance at odysseycruises.com. Chicago&apos;s newest beachfront hotspot, Shore Club, is nestled between the bustling Lakeshore Trails on the edge of North Avenue Beach. Floor-to-ceiling windows, a beachfront patio and cabanas promise sweeping, panoramic views of the show. Three distinct spaces within the venue—the Patio at Shore Club, the Restaurant at Shore Club, and the Oasis at Shore Club—offer a dining option for every taste and comfort level. 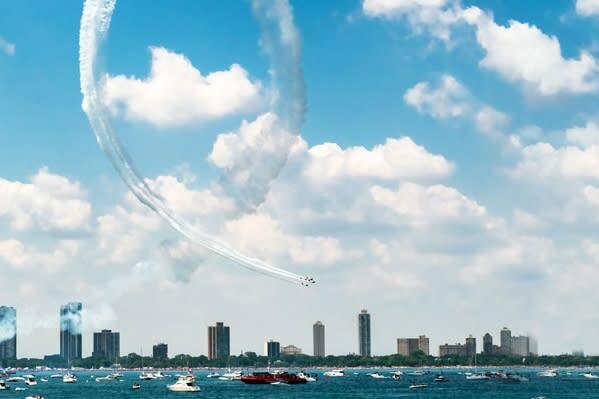 Shore Club will be offering prime, beachside seats all weekend long for the Air & Water Show. On Saturday, August 19, and Sunday, August 20, guests can purchase tickets to gain entry to Shore Club’s patio with exclusive access to the restaurant. The signature Shore Club Brunch will be included (9a.m.– noon), as well as a premium open bar. A preshow event will also be held on Friday, August 18. VIP cabanas are available in the Oasis at Shore Club as an upgrade to the General Admission tickets. Tickets, which range from $125 to $750, are available for purchase at airwatershow.com. Top image courtesy of Choose Chicago. Miller Lite Beer Garden image courtesy of Navy Pier. Bottom image courtesy of Odyssey Lake Michigan.